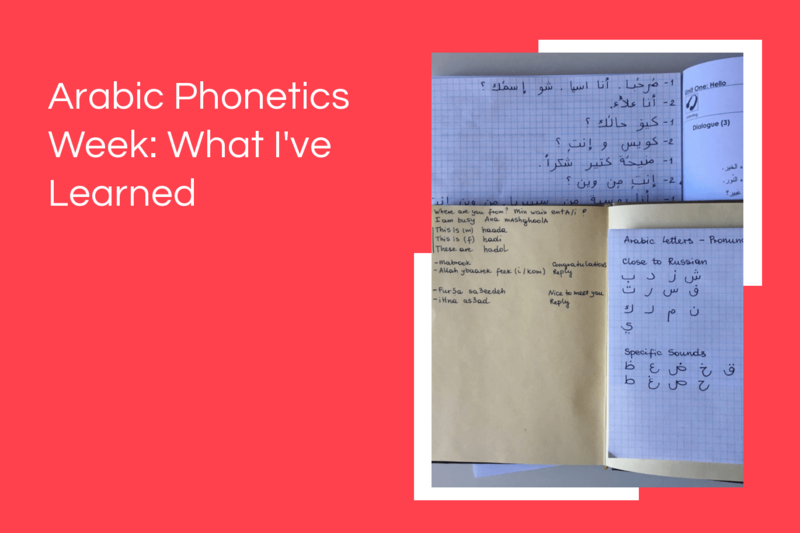 Last week of my language marathon was related to Arabic phonetics. The first task was not a hard one: to divide Arabic letters by sounds similar to your native language and special sounds. I've divided them into three groups: sounds that are closer to Russian sounds, English sounds and Arabic unique letters. Here's what I've got. The next part of the phonetic task was related to the pronunciation refinement, yet I'm studying Jordanian colloquial Arabic, therefore sounds vary. In general, it's interesting to see the difference in the pronunciation even within the Levantine dialect. I have taken my main book, it's "Yalla Ndardesh" from the French Cultural Center in Amman and practiced the sounds in the phonetics chart, as well as all the basic dialogues in the book (it has a CD), line by line. It could be even better if I was checked by a native speaker for a random talk, to define how many words I'm able to repeat from a sentence, even without the understanding, yet there will be a week focused on listening in the future. I also defined the Arabic transliteration I'm going to use for myself, as I'm planning to create a database of Jordanian Arabic words with the audio, yet the Arabic writing is not my number one priority. 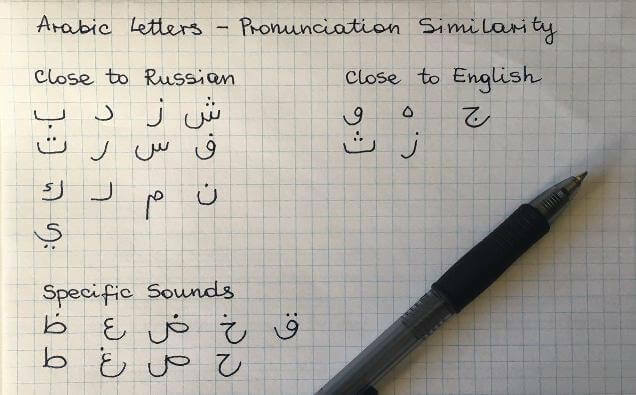 I don't know at the moment if it's the right approach or not, yet I want just to memorize as many words as possible, and reading in Arabic syllable by syllable is hitting on my nerves, so I have chosen transliteration as the preferred variant. I don't say that I'm neglecting writing part in Arabic completely, this week I have prepared a dialogue in Arabic and practiced it with a native speaker, however, it's not my main priority, as I've said. I'm finishing the book for Arabic letters writing, the only issue I have is the letter 'meem'. 1. In Arabic there are no words with three consonants in a row. That’s why it’s hard for an Arab speaker, not familiar with any other language, to pronounce words that contain more than 3 consonants together, like “world” in English or “izdevatel’stvo” in Russian. Fusha at-turrat, classical Arabic, used in Qur'anic recitation. You will be able to read Qur’an. Fusha al-asr, or so called Modern standard Arabic, (MSA). You will be able to read modern books, newspapers and magazines, write texts and correspondence. You won’t be able to use MSA for communication, just repeating this in case if you are still searching for information which variant of Arabic you should study. Ammiyyat al-mutaqqafin – "colloquial Arabic of the intellectuals", the formal spoken language among educated people. Managerial meetings, formal speeches are related to this variant of colloquial Arabic. Ammiyyat al-mutanawwirin – "colloquial of the literate", the informal spoken language between educated people. Office talks, job discussions, after-work talks. This is what you mostly be focused at while studying colloquial Arabic. Ammiyyat al-ummiyyin – a colloquial Arabic language modification of the illiterate/not educated people, rural pronunciation of various sounds, rural dialect words, more fluency with the grammar in comparison with the “educated” variant. 3. Arabic transliteration varies, in chats and informal online talking numbers can be used. There are different names for it, such as Arabish and Arabizi (عربيزي). I still complain about Arabic, for example I can't understand why in present tense a verb in the 2nd person Masculine Sg (enta btishrab) and 3rd person Feminine Sg. (heyyeh btishrab) are the same. There are of my worderings yet to come. The ability of doing something that you couldn't do a week ago, is very satisfying. I should admit that even a slow reading process in Arabic is awesome. I can't master sounds KH and H yet but I will! At the moment I'm just out of breath and don't have enough oxygen. And my throat hurts!